Protests in the region began on March 30 with March of Return demonstrations along the Gaza border fence calling for the return of Palestinian land taken in 1948 for the creation of Israel. ​Speaking with Radio Sputnik news analyst Bob Schlehuber, Soheir Asaad, a lawyer with Adalah — The Legal Center for Arab Minority Rights in Israel, said that Israel's continued aggression toward Palestinians is in an effort to change the demographics of Israel and Jerusalem. "In the recent months we've witnessed so many laws that have the aim of controlling the demography," Asaad told Schlehuber. "Engineering the demography of the population of Jerusalem in general and East Jerusalem especially, and the annexation of land… for example, just recently there were three bills… two for annexation, which will annex around five settlements around Jerusalem, which means around 280,000 settlers would be added to Jerusalem." "So while settlers are being added… more and more Palestinians are being pushed out outside of the city in complete violation of international law," she added. In addition to the annexation bills, Asaad explained that Israeli lawmakers had also brought up an amendment that would "limit" the chances of Palestinians ever seeing Jerusalem become the capital of an independent Palestinian state, since its text would prevent lands considered part of Jerusalem from ever being handed over to another entity. "Now, as we stand here, we keep looking at our phones and count victims of killing in the border of Gaza, which means the US and Israel are backing the embassy, while the US is giving the green light to Israel to kill more and more demonstrators in Gaza… we are witnessing a huge massacre," she stressed, adding that billions were "going into projects to increase Israel's sovereignty over Jerusalem." Though the US had previously played the role of mediator, Asaad told Schlehuber that this was no longer the case. "Of course it is not a mediator," she said. "We are in a day, again, where massacres have been happening while the US is celebrating with Israel here." 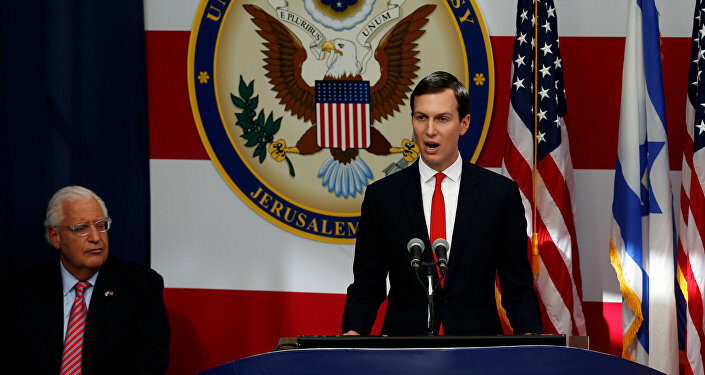 "We are witnessing a complete partnership between Israel and the United States towards oppressing Palestinians and violating their rights, not only in Jerusalem but oppressing Palestinians in the West Bank… so basically the US is playing a major role in pushing toward more and more injustice and crisis in the region," the lawyer pointed out. With Israel appearing unlikely to cease its aggression, Asaad said Palestinians may soon "try to get more international allies."